Three Surrey-based Local Food Britain members have combined their skills and produce to take food and drink repurposing and collaboration to another level. Reigate’s Crumbs Brewing is already well-known to brew its beer using leftover bread from Chalk Hills Bakery, and now Leatherhead’s Fair Dinkum Fare has got in on the act too. 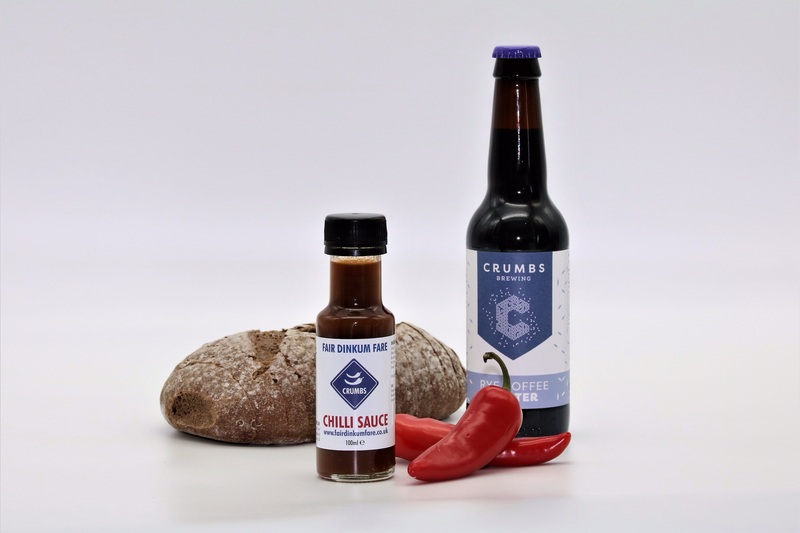 When Crumbs’ released their Rye Coffee Porter, which uses leftover rye bread and spent coffee grounds to help create its flavour, Fair Dinkum founder Mark Beale spotted an opportunity to use it for a brand new chilli sauce. Having tasted Fair Dinkum Fare’s Crumbs Chilli Sauce for the first time, Rosie Robinson, one of the founders of Chalk Hills, was excited about how they could use it on the food menu in their Bell Street coffee shop. “The chilli in the sauce is quite subtle and the dark rye coffee porter gives it a real depth of flavour – a little bit like a brown sauce,” says Rosie. “We immediately thought it would work well on a bacon sandwich. What’s more, all our bacon is sourced from Reigate butchers Robert & Edwards too”. And so, with bread turned into beer into sauce into sandwich, the Bacon Chilli Bloomer was born at Chalk Hills Bakery - not only a great snack but also a unique exercise in repurposing and local business collaboration. The new Crumbs Chilli Sauce and Bacon Chilli Bloomer will officially be launched at 6pm on the evening of Friday April 26 at Chalk Hills Bakery on Bell Street in Reigate. The teams behind the sauce, the bread and the beer will be talking about their great local produce and there will be plenty of opportunity for visitors to sample their wares. Collaboration is one of the biggest buzzwords around in business at the moment, but it's a good one. We always love to see our Local Food Britain members getting creative together. One question remains: how do you follow up bread into beer into sauce into sandwich? If you're working on any similar collaborations at the moment, please get in touch with matthew@marketplace.uk.com as we'd love to shine a spotlight on your efforts.